So you hire a website design and development agency to create a custom website for your company. You procure the web design agency to help you in planning, designing, strategy, creation, development, testing, approvals, tweaks, and final deliverables. But, it’s not enough to “deliver” a website to a user. You should also make sure to be prepared to make changes in another case. Without prior insight and knowledge of knowing what to expect, you might think you can handle website maintenance yourself. Thus leaving your new website on your old website hosting plan and servers. What happens when within the first month, for what seems like a blink of an eye, your site has been hacked, destroyed, or deleted, with no possible way of ever restoring it? Or, you create a new page, and end up messing up other pages in the process? This actually happens more than you can imagine. Your website plays a big role in your business’s success. That’s why it’s imperative for regular WordPress support and maintenance. It’s a task that is paramount for various reasons, like version upgrades, regular back-ups, maintaining the database, plugin updates, removal of unused plugins, cleaning spam comments and never published draft posts and much much more. 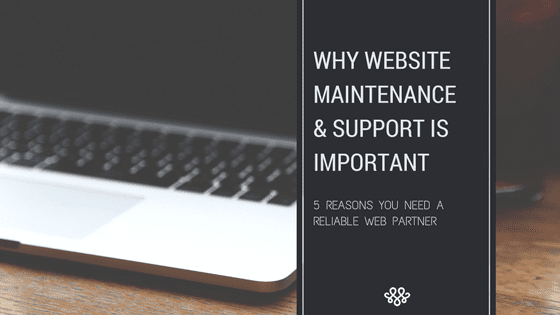 However, there’s so much more to website maintenance than just these things and that’s why you need a reliable, trusted partner. As a business owner, your focus should be on growing your client base and making money, not on website support. If you don’t keep your website updated, it becomes more prone to being hacked. You may even think that your company is simply not significant enough to get hackers’ attention. Unfortunately, this is simply not the case — hackers do not discriminate. If you see a red circle with a number next to Updates in your WordPress Dashboard, you should not ignore it. These are updates to combat known threats. However, it’s best to have your website manager complete and monitor the updates as sometimes they can interfere with other website functionality features if not done properly, at the right time, or tested accordingly. While not every update has to do with addressing security issues, the changes may still be significant enough to affect the functionality of your website. Once a major WordPress update happens, your site files and plug-ins may need to be updated as well to make sure that everything still looks and functions as it should. It’s important to run scheduled back-ups of your site files. Not only should you update site files and plug-ins and run scheduled back-ups, but you should make sure there are no inactive plugins or inactive themes that you are not using. If there are, your website manager or agency should delete them from the directory. It won’t affect the appearance of your website. However, it can slow down your WordPress site, and it is an opportunity for the hackers to get in through that code. If you want to speed up your WordPress website, you should always maintain and secure it properly. If your site becomes slow from lack of proper maintenance, visitors will leave and go to a competitor’s site. Plus, the slow load time can affect your page rank with the search engines which means less visibility. Quality and capabilities of your web server have a direct impact on your website. It affects page speed, vulnerability exposure, security, and much much more. If you host with a big name company, you are probably on a server with hundreds if not thousands of other websites, which potentially increases your website’s risk for attacks. You’re also sharing bandwidth and storage resources with other websites — things that negatively affect the performance of your site. Website hosting may seem insignificant to you, it plays a major role in the quality of your website. It’s essential to do hosting through a server who your agency trusts. Managed WordPress hosting providers, like Flywheel, create environments that are fine-tuned to ensure that your site will perform at it’s very best. Relevant design, content, and mobile updates are also vital to keep driving visitors to your site. Once they land on your site, you want them to have a great experience so they keep returning or refer other customers. While WordPress is great at giving you the freedom to manage the content of your website on your own, it doesn’t give you the ability to easily make design changes to keep the “look” of your website fresh and attractive; this would require design and programming expertise. Search Engine Optimization (SEO) is a multi-step, continuous process that helps increase your website’s visibility in search engines. Website maintenance could be the difference on whether consumers are finding you or someone else. Much of SEO is based on the use of keywords for your specific service, product, location, and target market. Search Engine Marketing (SEM) focuses on promoting your website on social media, online business directories, and search engines. Properly implemented SEO and SEM strategy will improve search engine rankings, driving targeted visitors to your website. After all, you may have the best product and the best value, but if you’re not found online, you are not selling. Publishing fresh content and having a fast-loading site not only keeps your audience interested and on your site, but also helps with your site’s search engine ranking—where your site appears in search engine results pages. Appearing higher in search results than your competitors gives you a great advantage. That could mean more conversion, donations, memberships, or clients. You might think that you will save money if you and your staff maintain the site yourselves. But just like your car, it costs more to fix it if an issue arises than it does to maintain it properly. Regular oil changes help keep your car running properly; regular website maintenance helps keep your WordPress running properly. Furthermore, major issues can create higher costs. Having a reliable agency maintaining and backing up your site as part of a monthly care plan provides you reassurance. If your site is not on a maintenance plan and something breaks, agencies charge you an hourly rate to fix it. That cost could exceed the cost of a monthly care plan, and most likely will. Plain and simple, updating your site yourself will take you longer than it takes us. Why? Because it’s our expertise — it’s what we do every day. Especially if your agency designed and developed your site they will already know how it’s built, where to find certain things, and how to most effectively optimize the site without causing any negative domino effects. Time is money and doing your own website maintenance and support will just keep you from doing more important tasks. Biggest takeaway? Don’t allow your investment to go to waste! It’s not always a good idea to choose to rely on yourself, an assistant, or a “friend” (sister-in-law, friend, neighbor’s tech-savvy uncle) for WordPress support and maintenance. A true website maintenance partner can be extremely beneficial because they will be with you not only during the creation of your new ebsite, but with you for the lifetime of your company, growing with you each and every month.